I love this video of Ryan Adams revealing his daily songwriting method, that he calls ‘Stacks’. It basically involves taking one reference book (like the Roget’s International Thesaurus) on one side, and another random book—a novel perhaps—on the other side. Open each to a random page. Scan the page of the novel until a line or image catches your attention, then use it to create a version of that image. Go to your second book. Scan the page until you find a word or image that pops out at you…keep going, and fill in the blanks. It’s a beautiful approach that trusts in your own experience to join the dots. Almost all songwriters I know experience a type of road block in the process of writing songs. Paradoxically, this block seems to happen when you have a really good idea that you are particularly excited about. Put your hand up if you’ve ever written a verse and a chorus…and can’t seem to write a second verse! (Okay – hands down.) You labor for the next hour, week, month, but everything that comes out feels like you are simply dressing up the same idea in different clothes. Or worse – you are taking off the ball gown and putting on the jeans. 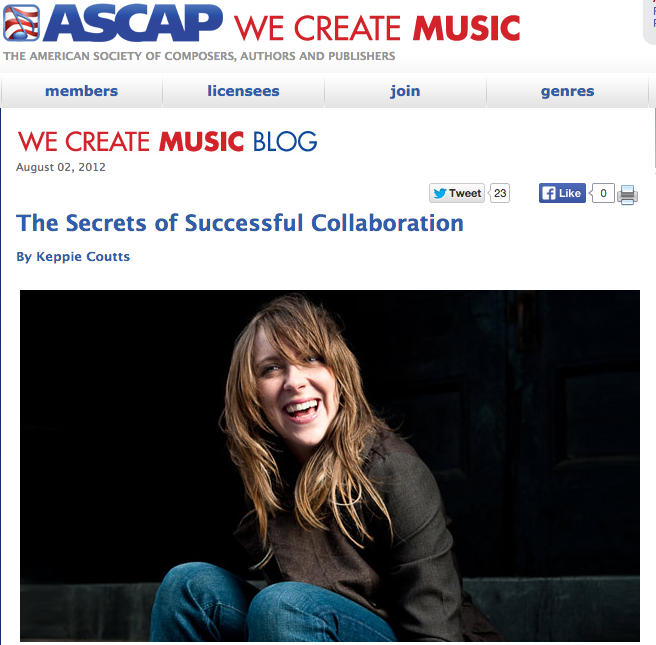 Thanks to ASCAP for once again publishing this article I wrote on two easy strategies for moving beyond the first verse. You can read the article in its entirety at the ASCAP We Create Music Blog. Creative collaboration is very much like dating. I can’t think of any other experience that comes close to the strange alchemy that either happens, or doesn’t. Everyone has that person in their life, someone you really admired and were absolutely sure if they just returned the admiration that you would dance, heel-clicking, off into the horizon…only to discover that your dream came half-true. You DID get close to that person, and found out that they only brush their teeth twice a week. Or yell at their mother. Or give you dirty looks when you eat meat. The idea of what you think your partnership will be doesn’t turn out to have the right chemistry even though you were sure it would. Well, creative collaboration is very similar, and also similar in the way that you get better at predicting success, knowing what to look for, being totally fine when it doesn’t work out, and counting your lucky stars when it does. In 1968, a psychologist called Roger W. Sperry published his groundbreaking study that showed that the two hemispheres of the human brain – the left and the right – process information in very distinct ways. Since then, there has been a lot of research and interest in left-brain and right-brain theories, and how this relates to creativity. One thing is for sure – songwriting is a Whole Brain process. It requires you to access your ‘right brain’ mode of cognition, when you are gathering ideas, making connections, being inspired, finding out what the deeper meaning of your work is, or even letting your subconscious figure out the right word, image or line. It also requires you to access the ‘left brain’ mode, when you putting your ideas into a structure, making decisions about rhyme scheme and meter, cutting out lines, switching verses, rewriting melodies, testing out different points of view, checking for consistency in your tenses, and cutting out all the times you use the words ‘just’ or ‘really’ in your song! Most of us relate to one part of the process more than the other. We might be ‘right-brain’ dominant, and find it really easy to get inspired, to have lists of beautiful images, to spill something heartfelt onto the page. Or we might be more ‘left-brain’ oriented – deciding on a song form early on, setting the meter or melody early and challenging ourselves to find word combinations that sit within that structure, choosing and interesting, challenging, and unusual rhyme scheme from the start. Either way, at some point, we need to engage with all of it, and that is what ‘songwriting is’ – it is inspiration and imagination within a structure and a pattern. Sheila Davis has written about these topics in ‘Successful Lyric Writing’ and ‘The Songwriter’s Idea Book’. ‘Drawing from the Right Side of the Brain’, Betty Edwards.